Waterbloc GRP is a flexible, permanent solution to interior waterproofing which does not leak, buckle or crack – creating clean smooth finish which can be tiled. Our experienced installers can apply Waterbloc GRP to any size or shape room. 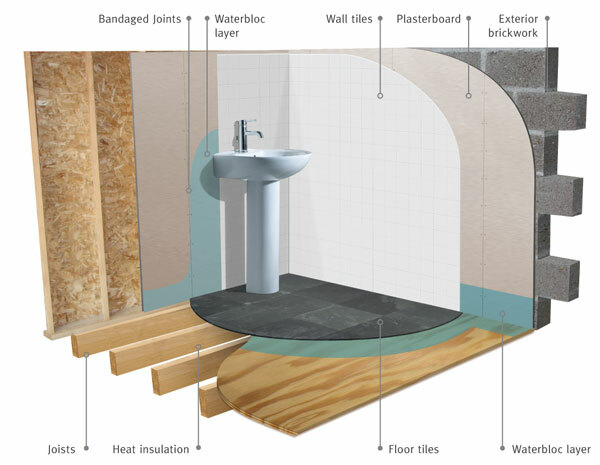 Before starting, your wetroom should be boarded with water resistant plasterboard to the walls and ply to the floor, ask your local installer for specifications. Waterbloc can then be applied to surfaces in layers creating a watertight seal around areas that are most likely to come in to contact with water. We recommend that Waterbloc covers the entire floor with 100mm depth around the room, behind taps, around water inlets and outlets and around the bath and shower areas. 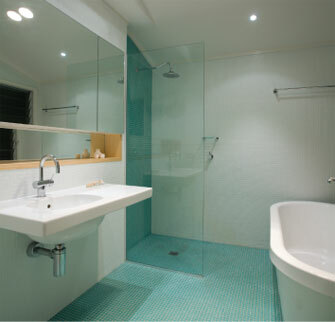 The illustration opposite highlights in green where Waterbloc is applied in this bathroom. GRP is waterproof, tough and maintenance free, making it well suited for external and internal applications. It’s also hygienic, resistant to mould and is able to cope with normal structural movement. GRP is used in the manufacture of bath tubs, boats, Gliders, sports cars, fluid tanks, wind turbine blades, water slides and flat roofs all over the world.